For cleaning floors in offices, schools, hospitals, canteens etc. Suitable for use on linoleum, PVC, rubber, sealed wood, sealed cork and thermoplastic floors. 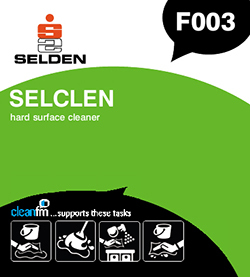 Selclen is also an excellent wall and hard surface cleaner. N.B. Not recommended for terrazzo or unsealed wood and cork. For general cleaning dilute Selclen 1 part to 40 parts hot water. For damp mopping dilute Selclen 1 part to 80 parts warm or cold water. Composition A blend of nonionic and anionic surfactants, chelating agents and solubilising additives.